I make beer bread all the time. Sometimes I make it flavored but oftentimes it’s just a basic beer bread. When I want it flavored I’ll use add-ins that I enjoy such as homemade basil pesto & sun-dried tomatoes with olive oil to make a Pesto-Flavored Bread. Sometimes I’ll chop fresh rosemary from the garden & add cheddar cheese for a delicious Rosemary/Cheddar-Flavored Bread. Or one of our faves, cheddar cheese & diced jalapenos. I’ve even added brown sugar and cinnamon-spiced apples for a deserty kind of apple cinnamon bread. It’s all delicious! But it occurs to me I’ve never written a post about my basic beer bread recipe. Mea culpa! Beer bread doesn’t require rising or kneading. It’s a quick bread that uses beer for the liquid requirement as well as the yeast. For flavored versions of beer bread I usually prefer a lighter-flavored beer such as a lite pilsner so the tastes don’t compete. 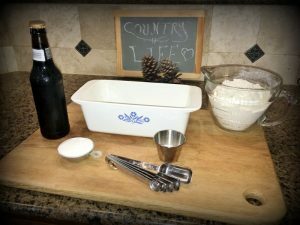 But for the basic beer bread recipe I typically enjoy a more flavorful beer such as a bock or even a stout. For the basic recipe I want the flavor of the beer to shine through! But I typically use whatever I’ve got. Even with a lighter-flavored beer this bread is delicious. And not only is this an easy recipe but there are precious few ingredients. Basically it’s just all-purpose flour, sugar, salt, baking powder & beer. NOTE: remember the basic rule of making bread – never just scoop the flour into the measuring cup. Measuring flour that way ensures you’re adding too much flour to your recipe. Instead use a spoon to fill your measuring cup, then use the back of a knife across the top of the measuring cup to scrape off the excess. This will assure you are measuring the correct amount of flour. I like to add melted bacon grease to the top of the loaf about 10 minutes before it comes out of the oven. That step makes the crust less crunchy and the bread moist and more flavorful. Of course you could skip this step for a crustier crust but RancherMan & I prefer it this way. I love to whip up a quick loaf of beer bread to enjoy with our supper. Heck I’ll often bake two loaves at a time – sometimes different flavors! It’s just as easy to whip up two loaves as to bake only one. They both cook in the oven at the same time using the same electricity. Truth be told, I’ve even made a couple of loaves when we didn’t have homemade Sandwich Bread to spread our homemade Egg Salad on. I mean c’mon, no kneading, no rising – just mix & bake? Yes please! Yeah I can be a lazy cook sometimes… But what’s not to love about this recipe? The bread is hefty, yet soft & moist. And the taste?? DELICIOUS! Preheat oven to 375 degrees (350 degrees for glass pan.) Mix dry ingredients together, then slowly add beer & stir to combine. Transfer batter into well-oiled 9×5 glass loaf pan and bake on middle rack for 45 minutes. Remove pan from oven and pour 4 tablespoons of melted bacon grease (or olive oil) evenly over the surface of the loaf. Then return pan to the oven for an additional 10 minutes baking time. When baking is complete, remove the pan from the oven and allow to cool for 10 minutes. Then carefully remove bread from pan and place on baker’s rack. Cover the warm bread with a clean kitchen towel & allow to cool completely. 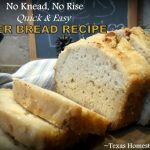 Ok Tammy ,So you have convinced me to go buy some beer now ….lol I needed a good excuse to buy it and this bread recipe fills the need for buying beer…. lol. I drink beer maybe once a year, but have never tried it in bread, beer batter pancakes hasn’t happen yet either but there are those who swear by it. 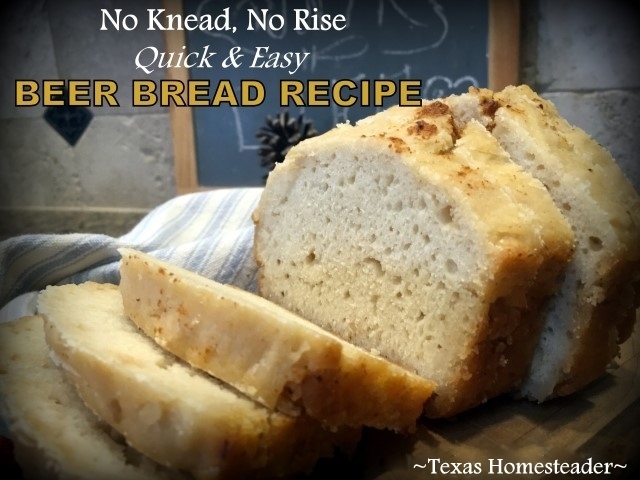 Right now I love the super-fast no-knead, no rise bread idea … done in an hour, is right up my alley. I’ll be giving this one a try this week. Thanks for sharing, if I do well with this then off to the flavored one’s. Thanks again. That looks so good! I absolutely love fresh baked bread. You just can’t beat the taste (and the added bonus of a house that smells amazing all day lol) Great recipe! Thank you for sharing this. I often want to make bread but sometimes don’t have the time. Thank you Tammy, that does sound delicious, I can’t wait to try it!